Start of ride to Carp Siding about 100 miles northeast of Vegas. Ken, tearing up the road to Carp Siding. Has to avoid tarantulas crawling across his path. Over 90 cars of freight came through just as we arrived at Carp Siding. Started to rain slightly. Made for a dramatic ride alongside the train as we passed under trestles and over water covered roads. Just past Zion Natl. Park -- on the way to Grand Canyon. 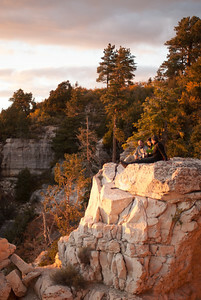 Peak at North Rim lookout. Grand Canyon Lodge (upper right) was quiet due to the government shutdown. Arizona kept it open, but people changed their plans so rooms and restaurant reservations were easily available. Raven posing for park vistors. Great campsite just a mile and half from the lodge. Motorcycle parking under the tall trees. The official adventure rider salute. Whisky Point. It's called that because we drank whisky there while watching the sun set. Ken, forming his plan for a Rim to Rim hike. Mark, regretting that he didn't have room on the bike for his wing suit.